A manufacturer of outdoor appliances contacted us regarding a project for a grill handle application. The customer required a handle component that is not only heat resistant, but durable enough to retain excellent aesthetic properties even when exposed to various outdoor conditions, including moisture, UV, and a wide range of temperatures. After researching various heat-resistant plastics, our customer selected Plenco 06511 – a phenolic thermoset material – for the grill handle component due to its heat resistance, surface finish quality, and dimensional stability after thousands of hours of use. 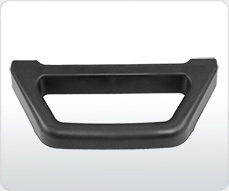 This handle is injection molded from a 2-Cavity tool within a 500-ton thermoset injection machine, and weighs roughly 210 grams as a finished component. The finished component is deflashed before being shipped to a customer in Canada. Product Description This phenolic handle is used within an outdoor grill application.